Abu Dhabi-based Calidus took advantage of Dubai Airshow 2017 to highlight its B-250 light attack/trainer, being developed with partners Novaer, Rockwell Collins and Pratt & Whitney Canada. Abu Dhabi-based Calidus took advantage of Dubai Airshow 2017 to highlight its B-250 light attack/trainer project. The first prototype made its maiden flight in July, just two years after programme launch. Having identified a UAE requirement for this type of platform, Calidus teamed up with several foreign partners to bring the project to fruition. 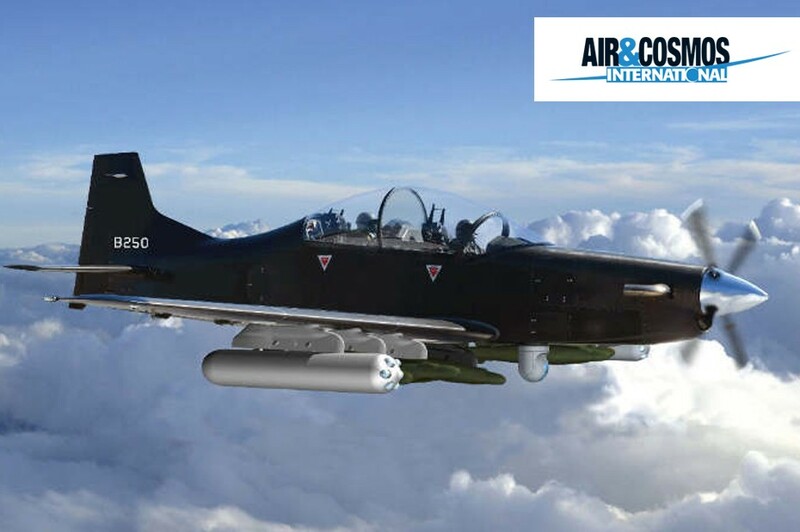 The airframe was designed and built by Brazil’s Novaer, which was involved with the highly successful Embraer Super Tucano light attack aircraft. Novaer came up with an all-carbon fibre design offering reduced weight, improved manoeuvrability and autonomy, and an extended service life, according to Calidus. Ballistic protection is available if required. The aircraft offers maximum autonomy of 12 hours and a top speed of 301kts (557km/h). The B-250 is equipped with a Pratt & Whitney Canada PT6A-68 turboprop engine. The fully pressurised cockpit features two 0-0 Martin Baker ejection seats. The service ceiling is 30,000ft. The landing gear is reinforced for operations from unprepared strips. The cockpit features a Rockwell Collins Proline Fusion suite — the first time the system has been installed on this type of aircraft. The system features advanced graphical interfaces integrated with a digital Head-Up Display (HUD), intuitive icons, easily configurable touchscreen and multi-function display windows, all designed to provide enhanced situational awareness during all phases of flight and in different flying conditions. The model displayed at the show was also equipped with a Wescam MX-15 optronics turret and a selection of UAE-produced weapons on its seven hardpoints. A second aircraft has been built, and Calidus has plans to develop a local production facility.